At the beginning of the last century, the wall of Susano was already used as a sandstone quarry. It is only since July 1993 that it begins to be taken into consideration as a equipped rock gym. The upper wall, thanks to its visibility from the path, is the first to see the bolts. Three streets are born, thanks to a small 7.2 volt B & D. Next to it the exploration of the underlying wall began, which then became the strong point of the cliff. It is a wall of typical local character. If combined with the nearby Boulder area of ​​MUSCHIA could come out a day of all respect. The coordinates of the spot boulder are: 44 ° 15'49.77 "N 11 ° 03'30.97" E (... see you soon on falesia.it!). 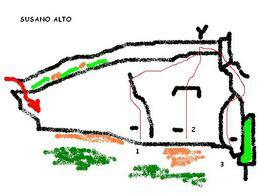 Access: The Susano small farm is reached by the SS64, which from Bologna, goes in a southerly direction, towards Vergato. Once in Vergato, take the provincial road to Cereglio-Zocca, and follow it for about 7km. Arrived in Susano, we advise you to park (... with care) in the open space adjacent to the Pizzeria; on the left, at the end of the agglomeration of houses. Approach: Take the narrow asphalt road in front of the car park (it passes between a wall and a yellow house, which soon becomes a dirt road.) Do not try in any way to continue with the car! minutes, until you go past two houses Once you reach a clear clearing, there are two possibilities: Continuing along the main path in two minutes you reach "Susano Alto." 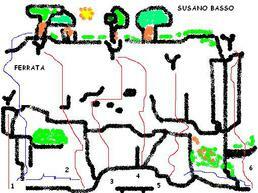 Going down to the right, you will come to "Susano Basso". For "susano basso", near the rocks, follow a good track on the left and reach the horizontal steel cable that leads to the base of the roads. Gear: Very good to spit (fix) and nails with resin.